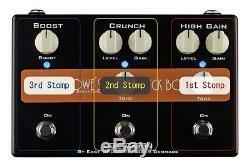 Carl Martin GREG HOWE'S LICK BOX dual distortion unit + booster From Japan F/S. Condition: Brand new Manual: Japanese 100% GENUINE PRODUCT. This product is a JDM product (Japanese Domestic Market) Japan Usage Item. Greg Haig signature model based on PLEXITONE. Independent on / off of two overdrives possible. Built-in clean booster as well as PLEXITONE. · Input impedance: 1 M.
· S / N ratio: 54 dB. · Maximum gain (high gain channel): 89 dB. · Maximum gain (crunch channel): 60 dB. · Maximum boost gain: 12 dB. · Power supply specification: AC adapter 9 VDC / 150 mA Center minus. Dry batteries can not be used. Since the AC adapter is not included, please prepare separately. · Maximum current consumption: 100 mA. · External dimensions: 188 (W) x 123 (D) x 56 (H) mm. Sometime SAL or Epacket takes a long time. About other area, please ask me. The reason why that happens is a post officer in your country does not update the info when the item get your country. If the item gets lost, I will turn a paper in a post office to research where the item is. I asked post office to improve the system, but please keep that in your mind. So, do not worry about it. Thank you for your understanding. This product is a JDM product (Japanese Domestic Market). (It might be more than a month). So please keep that in your mind before purchasing item. Please see goods, thank you. I'm Japanese living in JAPAN. Our Products are 100% Authentic! I correspond from the bottom of my heart. If it may not understand, please ask a question always. We will find any item for you. 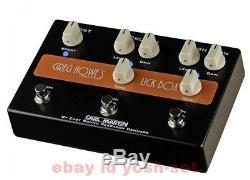 The item "Carl Martin GREG HOWE'S LICK BOX dual distortion unit + booster From Japan F/S" is in sale since Monday, June 11, 2018. This item is in the category "Musical Instruments & Gear\Guitars & Basses\Parts & Accessories\Effects Pedals\Distortion & Overdrive". The seller is "yosh-set" and is located in kyoto. This item can be shipped worldwide.